Renato Rozic – composer, jazz guitarist, arranger, interpreter of works by J.S. Bach, W.A. Mozart and A. v. Webern, was born in Zagreb, Croatia into a musical family, exposed to jazz from an early age and instructed by his guitarist/double bassist father. He abandoned his studies of the natural sciences in order to live in Germany where he embarked on the formal study of music. 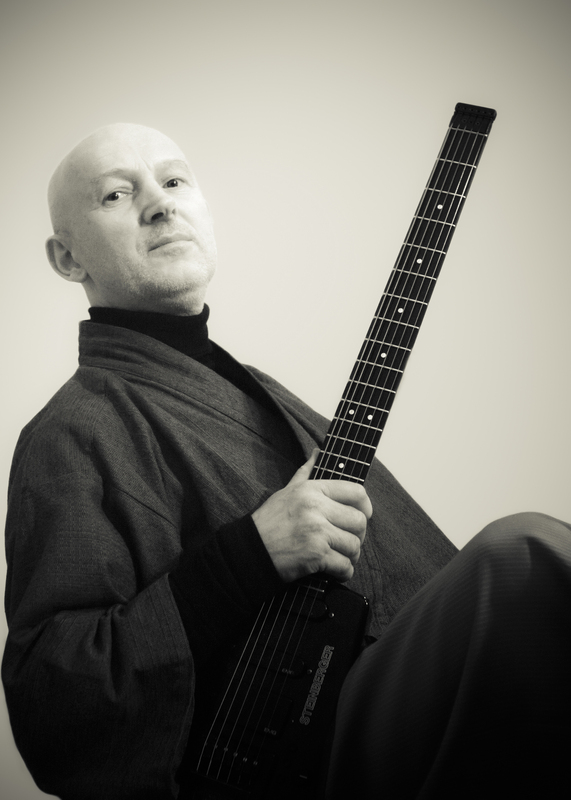 For 14 semesters he studied jazz guitar, improvisation, classical music and composition at Musikhochschule Köln. Renato Rozic the musician and his work is not easy to sum up. The press has called him the ‘Stanley Kubrick of Music’ due to him working in genres, not unlike the great film director and cinematographer Stanley Kubrick – classical, modern classical (with an emphasis on Bach, Mozart and A. v. Webern), jazz, funk, world music and contemporary music. His first official release was the CD ‘Renato Rozic: Mozart’. It was released in 1996 and features Renato Rozic playing with his trio (high-end guitar, classical acoustic guitar, double bass strung with gut strings). Pieces on this release include Mozart piano sonatas for which he developed the high-end guitar (a Steinberger headless electric guitar, mounted on a stand). He devised this high-end guitar for improved dexterity, beneficial for playing Mozart’s piano music – the instrument mounted on a stand, he does not have to support it and hold its weight with his own body and can move more freely around it than he would be able to do, if he was using a guitar strap. ‘Mozart’ polarized the ‘classical scene’ for quite some time. It was praised on the one hand (Murray Perahia, Deutsche Mozart Gesellschaft, and others) but was, on the other hand harshly criticized by more traditionalist listeners, as an electric instrument was used to play Mozart’s music. In 2000 ‘Mozart’ was released by Emi-Electrola (Virgin Classics). In 2006 two releases followed – ‘Renato Rozic: Bach’ and ‘Renato Rozic: Jazz’. The first looks at the music of the great barock master J.S. Bach from the perspective of a jazz musician and improviser. Here, Bach’s cello suites were arranged for and recorded using an electro-acoustic jazz guitar. ‘Bach’ received recognition and praise from both the press and professional circles alike (Ton Koopman et al). The Jazz CD, by comparison, looked at jazz from the viewpoint of a classical composer. Here, Rozic set jazz standards and original pieces to sonata form. The most recent CD which took Rozic a further 7 years to complete is ‘Renato Rozic: Black and White’. It was released in 2012. Here, two important western musical philosophies are examined – ‘Black’ is dedicated to an afro-American approach (‘Black’ standing for groove, triplet, jazz, funk, hip-hop, blues; music displaying characteristics widely associated with afro-American music). ‘White’ represents western musical philosophies – more precisely it is classical modernism with a focus on Anton von Webern (features such as Sonata form, complex tonalities and serialism). Renato Rozic is currently completing his newest CD ‘Renato Rozic: World Music’. Here he fuses Western classical, afro-American and Indian approaches to music making resulting in a very current world music. He does this through focusing on those intellectual elements such as the construction and complexity of the material that, definitely set these three styles apart from folk music (folklore). Renato Rozic and his ‘Renato Rozic Consort’ perform at renowned festivals of classical music and jazz (Mozartfest Würzburg, Bachfest Leipzig, Köthener Bachfesttage, MDR Musiksommer, WDR Nachtmusik etc.). He has played numerous concert halls, such as Alte Oper Frankfurt, Philharmonie Zagreb and others. He has also been part of a number of radio productions (WDR, MDR, BR, HR etc.). Among these were live interviews (SR, DLR, WDR, MDR, BR, Radio Bremen etc.). As a soloist and artistic director he has worked with a number of orchestras in the areas of classical music and jazz. Konzert für Oboe KV 314, Klavier Konzert KV 414, Konzert für Violine KV 207 etc.